At higher elevations, particularly on north-facing slopes pinyon and juniper trees cling to shallow, rocky soil. Pinyon nuts have long provided food for humans and wild animals. Ranchers built fences from juniper; you can still see remnants near abandoned homesteads. 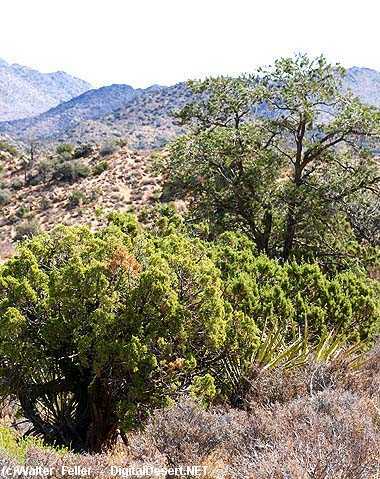 This habitat includes sagebrush, goldenbush, wildflowers such as Indian paintbrush, and Mojave prickly pear cactus. Also look for scrub jays--blue but not crested--and antelope ground squirrels. Also in the high elevations, bighorn sheep can be found. These are a wild sheep that feed on grasses and other plants. They are best spotted near water sources. Hooves adapted to steep, rocky terrain allow them to escape predators such as mountain lions.